Bring plenty of sunscreen and cold drinks and prepare for a hot bite on your deep sea fishing trip aboard the Drop Back! 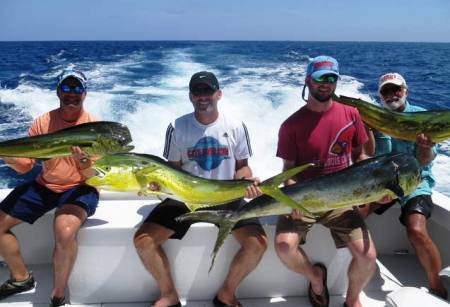 Summertime deep sea fishing is a local and family favorite due to the calm seas and hot Mahi action. Giant schools of various sized Dolphin (Mahi-Mahi) migrate via the gulfstream, just offshore of Islamorada. Average Dolphin range from 5 to 25 pounds, but catching Dolphin weighing 40 to 50 pounds is not uncommon. Most deep sea fishing trips result in fish boxes full of delicious Mahi and Tripletail. Tuna and Wahoo are also caught regularly, as well as an occasional billfish (Blue Marlin, White Marlin, Sailfish and Spearfish).